The Hittite Amulet – progress of a sort! Now that I have started on the main design element of the Hittite Amulet, I am entering a familiar and disheartening stage. There is so much more to do, it’s very concentrated work, and at the moment, I’ve not done enough to be confident it will work at all. 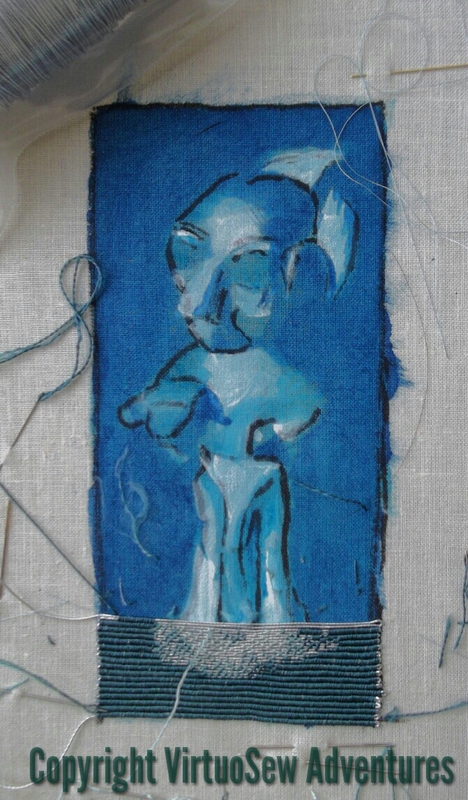 In fact there is a good chance that until it is completely finished, I won’t be sure that it is working, which in turn means I need to ignore my doubts and just keep at it! The fact that I have several needles with different shades of thread in them, all working at once, will explain why I can’t do very much at a time – I need to avoid tangling the threads, and as soon as I start to get tired, the threads tie themselves in such convoluted knots they’d make a macramé expert think twice! This close up should give you an idea of what is involved. I decided to allow the coloured silk stitches on the Amulet to be either across the same pair of threads as the background, or across pairs which are off by one. This should allow me to be a little more precise in colour placement. It may or may not matter, but I felt that since this is such a strange piece, I wanted to have as much flexibility as possible. I have already discovered that in some ways the straight rows are harder than the spiral that I used for Christus Natus Est. As the backing fabric sags, and the stitching became more widely spaced over the Amulet, I found that the rows were no longer straight. I’ve spent several sets of rows geting the rows more or less straight again, which was just a little scary! I’m in complete awe – this is going to look amazing. It seems a little like working a woven tapestry over a cartoon. I’ve only recently started following your blog but am so glad I found it. Oh my!! I’m sort of speechless looking at what you’ve accomplished and the process you have to go through. You are one special, patient person. I’m sorry to admit that if it were me the whole thing would have been an unadulterated awful mess right off the bat and probably would have ended up as far across the room as I could throw it. BUT you will persevere and it will be lovely — I know that! What you have done so far looks great. When we learnt Japanese beading we learnt curves before straight lines. I initially thought that was an odd way around but when we did straight lines I realised how much more difficult they are to get right. I like the way the picture slowly emerges with each bit you do but understand that progress seems much slower to you than our time-lapsed view of it. Wow. That looks amazing. Two questions–do you have a backing fabric on this to help with the weight, and are you keeping track of the time you’ve spent on this piece? He is emerging. I think this will be a special piece Rachel and all the attention to detail will be worthwhile. I thought about that piece of backing fabric as well. You might find a stablilser of some kind will help with keeping your lines straight. It looks difficult, but I think it’s going to be eye-catching when you finish. 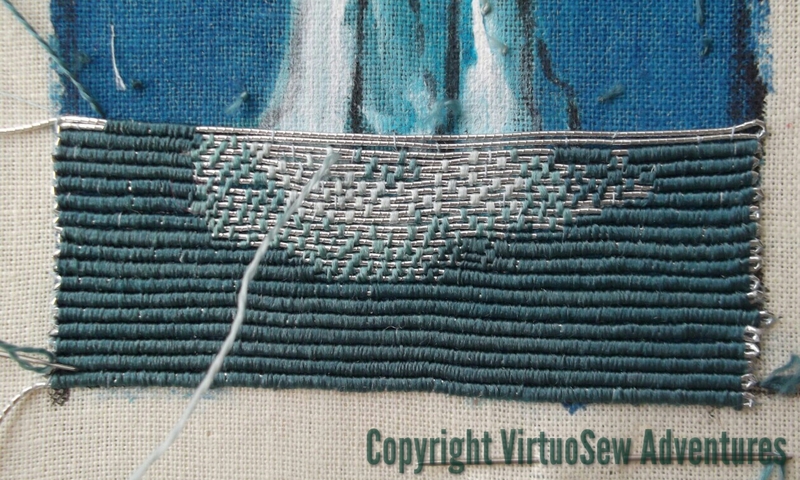 How wonderful to stitch in this way ! First sight I love it and see it’s going to be amazing. Such unique artwork. you are doing a fabulous job on this piece. i thought you were weaving until i read and looked closer. This will be a very striking piece! I love the way the silver highlights the figure. You may already know the following, but I just wanted to let you benefit from my mistakes- the first or nue project I worked had areas of solid silk coverage next to areas of very light coverage. It took a while for me to realize that closing the tiny gap between rows in the light coverage area eventually resulted in a noticeable ‘dip’ in the row. 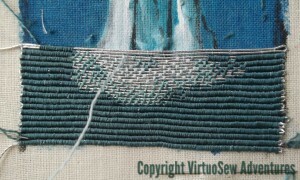 Even though I was using a single strand of filament silk, closing that small gap added up after 10 or 20 rows. Once I realized, I concentrated on keeping the row straight, even if it meant a sliver of the ground fabric showed between the rows in the light coverage areas. Keep up the great work! This reminds me of bobbin lace making…so much work! My goodness, this is just breath taking! Such a lot of work but I’m sure it’ll be stunning in the end. This is really looking great! I can relate to the tangled threads though. I hate when that happens.